Recently someone posted a link to this easy cake recipe on one of the EGID support group forums I belong to on Facebook. I was soon drawn to its simplicity, not least because it was already dairy-, soya- and egg-free, but also because the comments that followed suggested it could be easily converted to a gluten-free recipe too. What was even better was that I had the perfect occasion to try the recipe out – my Mum’s birthday. As you may recall, we had planned a special afternoon tea at the Grand Floridian whilst we were on holiday, but the actual date was now approaching and we had a family lunch booked for the day itself. I think it would be fair to say that my Mum is an avid chocolate-lover, one might almost say a chocoholic and there used to be a time when you’d be hard pressed to find her without an emergency chocolate bar stashed in her handbag, glove box or on the top shelf of the fridge. Bearing that in mind, it was something of a no-brainer to decide on a cake that would satisfy her idea of chocolate heaven. 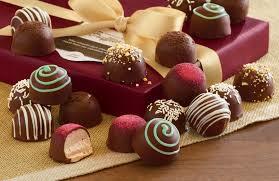 The bigger challenge was in making that creation both deliciously decadent and M-friendly. I doubled up the quantities in the chocolate crazy cake recipe and chose to mix the ingredients in a bowl, rather than in the cake tins themselves as I wanted to make 3 individual layers to sandwich together. I replaced the flour with a blend of rice and tapioca flour and added a pinch of xanthum gum to help it on its way. The cakes that came out of the oven appeared to be beautifully moist and not too granular, although Mike’s first comment on tasting some of the trimmings was that they were a lot sweeter than my usual bakes. I swirled vanilla butter-cream icing with spoonfuls of Grandma’s strawberry jam (all the way from Canada) and used this to sandwich the layers together. Lashings of home-made chocolate butter-cream icing then covered the entire cake, before I finished it all off with a generous sprinkle of pearl drops, moo-free chocolate buttons and shavings of moo-free orange chocolate. 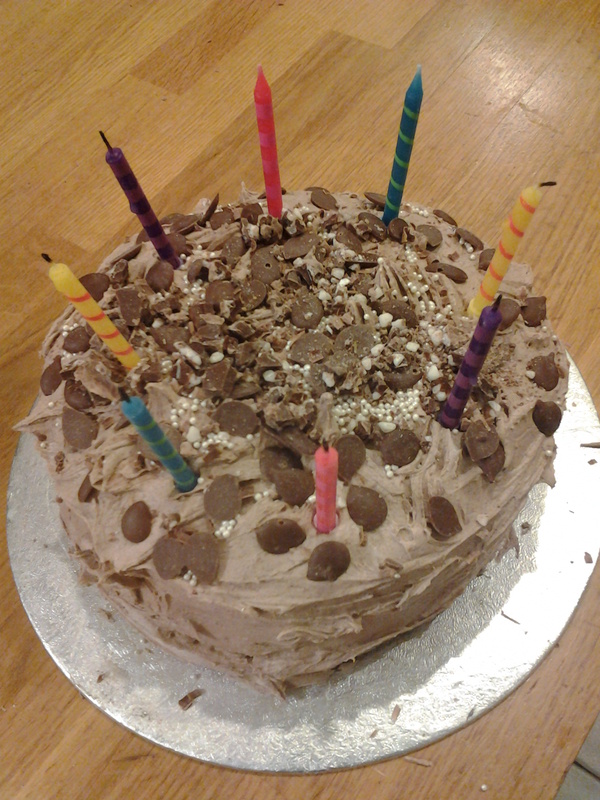 It looked like my idea of a chocolate-lover’s dream birthday cake and tasted good too. My Mum thought adding raspberries would have added a little sharpness to cut through the sweetness of the chocolate, but there wasn’t much left after her meal, which is always a sign of a good bake! This entry was posted in General and tagged Baking, Birthday, Cake, Chocolate cake, Dairy free, Egg free, EGID, Food, food allergies, gluten-free, Gluten-free diet, home cooking, love, parenting, Soya free, Special Diets, wheat free, Xanthan gum on September 29, 2014 by bluesingingdragon. Due to a slight miscalculation with my weekly local food delivery and the school holiday arrangements, we ended up with a massive glut of apples in the fridge. It seemed unlikely that we’d ever reach the end of the bags before the end of the summer holidays and so it presented the perfect opportunity to seek out and try my hand at yet another baking experiment. 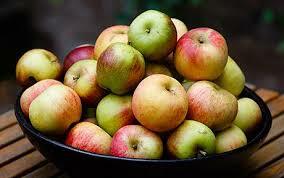 I looked for some apple cake recipes and found that most of them were of the spiced variety. Much as this appealed to my taste, I knew that G would baulk at even the hint of a spice in the cake and I was keen to make something she would enjoy too. When I first suggested apple cake, I had had to break it down into its component parts of apples and cake, to convince G that it might be something she’d like, so my final recipe had to be simple. 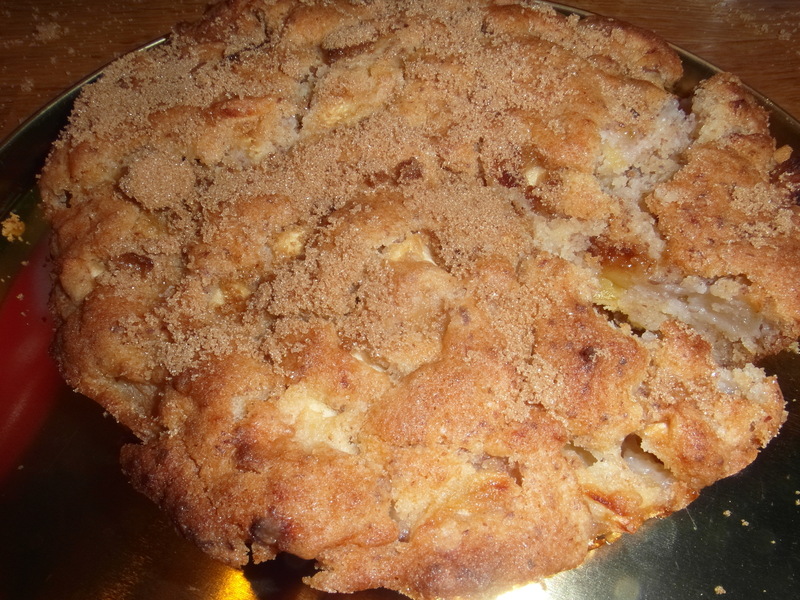 I found one for Dorset Apple Cake, a simple recipe containing nothing more adventurous than some ground almonds, which I thought both G and M would enjoy. The only downside was that it had not already been adapted for any type of special diet. However, the confidence I had found from baking my chocolate cake meant that I had every belief that I could take my new found knowledge and apply it to this recipe and make a success of it. I found how to turn my plain rice flour into self-raising flour, how to use flaxseed meal and water instead of eggs and the quantity of xanthum gum to add to help make the cake rise. I painstakingly calculated the new quantities needed of each individual ingredient, carefully weighed and measured them out and started on the baking process. My final adjusted recipe can be found here. 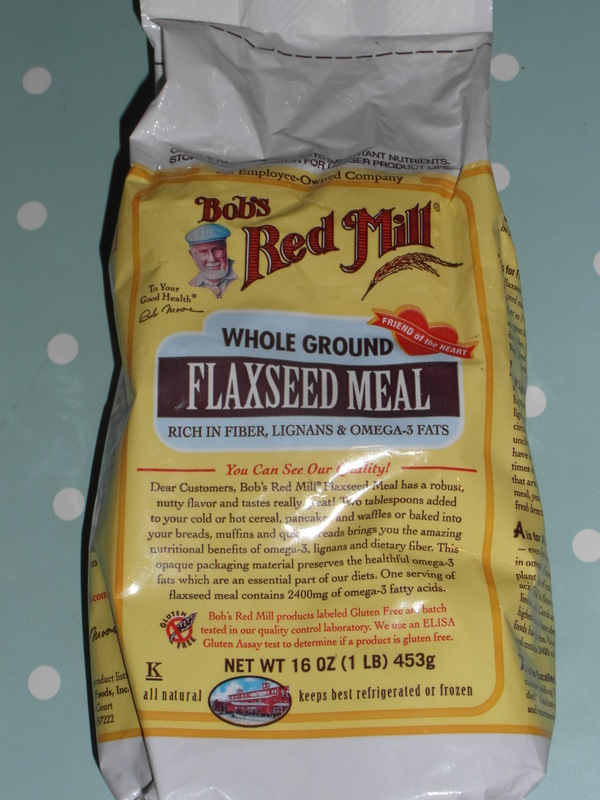 This was the first time I’d used flaxseed meal in my baking and I was a little nervous of how it would work. I had never even heard of it before reading this blog-post by fellow EGID Mum, mumannie123. She had recommended the Bob’s Red Mill brand and I was delighted to find them at the Allergy show when we attended it in June. I spoke at length to the lady who served me and gained a little more understanding about using it as an alternative to eggs. I duly followed the instructions on the pack and kept my fingers crossed that it would work. I ended up with slightly more cake mix than I had anticipated, so split it between 2 tins as it was just too much for 1. Given my past experience with cakes that don’t rise, I assumed that I would use my trusty container of Betty Crocker’s Vanilla Buttercream icing, which is MEWS (milk, egg, wheat, soya) free, to sandwich the 2 cakes together to create a perfect teatime treat. I needn’t have worried. Much to my surprise and huge delight, my calculations had not been in vain and I ended up with 2 beautifully risen cakes that needed no assistance from me to give them height. The cakes were moist, sweet and didn’t last long in the house, which is a sure sign of having got something right. M and G even struggled to decide whether they preferred the Dorset Apple Cake or the Best Chocolate cake in the world, though I didn’t fall for M’s less than subtle hint that perhaps I should bake both at the same time so he could do a taste comparison! This entry was posted in General and tagged Allergy, Apple cake, Awareness, Baking, Bob's Red Mill, Cake, Chocolate cake, Dairy free, Egg free, EGID, Flour, food allergies, gluten-free, Gluten-free diet, home cooking, MEWS, Soya free, Special Diets, wheat free, Xanthan gum on September 8, 2013 by bluesingingdragon.